Attention: last minute holiday recipe that will make you look like a star! Place 10 ounce bag of dark chocolate chips in microwavable bowl. Melt in 30 second intervals (probably 3) until you can stir as a smooth liquid. Pour in 1 cup walnuts and 1 cup raw cranberries (YES RAW!) into bowl. Stir until walnuts and cranberries totally coated. Drop by teaspoons onto wax paper. Put in refrigerator until hardened. Serve to oohhs and ahhs! Interestingly, these treats are very healthy. Dark chocolate provides polyphenols which may assist in lowering blood pressure and have a beneficial role related to cognitive function. Cranberries are also a source of polyphenols which have been shown to provide protection from some bacterial pathogens, cancer, cardiovascular disease and inflammation. California Walnuts provide omega-3 fatty acids (plant-based alpha-linolenic acid) which may decrease risk for heart disease. 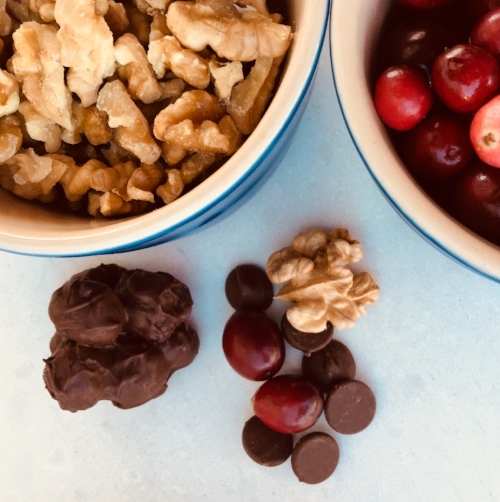 Walnuts taste fabulous coated in dark chocolate and paired with tart raw cranberries. This recipe begins with a gift from a colleague. A lovely gift: a bag of dried Blenheim apricots! I love all dried fruit, but never tasted a Blenheim. A quick search revealed that Blenheim apricots came from Europe and landed in California about 150 years ago. They were grown primarily in Sacramento and are unfortunately on the decline due to more profitable varieties crowding the market. Due to the very short growing season and limited fresh availability, much of the crop is dried. These moist halves are great as snacks, for dipping in dark chocolate, chopped and added to side dishes such as rice or couscous or incorporating into salads and baked goods. Apricots are a wonderful source of vitamin A and C and contain about 3 grams of fiber per serving (about 6 dried apricot halves). Blending dried fruits with nuts is a delicious way to increase fiber intake and provide filling nutritious snack options. I combined dried apricots and prunes with walnuts to create these Fall Fruit N Fiber Bars. They are very easy, store well and are completely satisfying with a cup of coffee for breakfast or a snack and will meet sweet tooth requirements after dinner. Get out your food processor and whip some up. Process apricots and 1 cup of walnuts. Press into an 8 x 8 inch pan using a rubber scraper to get every bit out of the processor. I used my Jimmy Kimmel spatula but any will work. Rinse and dry food processor and do the same with the walnuts and prunes. Press this mixture evenly over apricot-walnuts. Cut into desired portions and enjoy. This recipe comes from my mom's church group cookbook, "Bless This Food" published in 1970. It is easy, tasty and addictive. The recipe is unfortunately not one serving. Zest of 2 oranges unless you want more and I usually want more! Place sugar and juice in medium sauce pan and bring to 234 degrees (you need a fancy thermometer for it must be to this temperature). Once you achieved temperature remove from heat, add walnuts and zest and just start folding over and over until walnuts turn sugared or white. Put in bowl and eat.